Ohnenheim, a village in Alsace (coordinates: 48° 11′ 3″ N, 7° 30′ 20″ E), where the Dordrecht Confession of April 1632 was signed on 4 February 1660 in a conference of the Mennonite preachers of Alsace-Lorraine. Ohnenheim was the meeting place of the Mennonites who lived in the Bishopric of Strasbourg (see Colmar). Hege, Christian and Christian Neff. Mennonitisches Lexikon, 4 vols. Frankfurt & Weierhof: Hege; Karlsruhe: Schneider, 1913-1967: v. III, 295 f.
Neff, Christian. 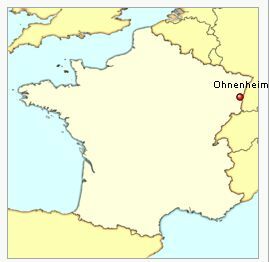 "Ohnenheim (Alsace, France)." Global Anabaptist Mennonite Encyclopedia Online. 1959. Web. 22 Apr 2019. http://gameo.org/index.php?title=Ohnenheim_(Alsace,_France)&oldid=145957. Neff, Christian. (1959). Ohnenheim (Alsace, France). Global Anabaptist Mennonite Encyclopedia Online. Retrieved 22 April 2019, from http://gameo.org/index.php?title=Ohnenheim_(Alsace,_France)&oldid=145957. Adapted by permission of Herald Press, Harrisonburg, Virginia, from Mennonite Encyclopedia, Vol. 4, p. 32. All rights reserved.